How about celebrating Valentine’s Day (or a few days afterwards) with a romantic hot air balloon flight in Southern Thailand? 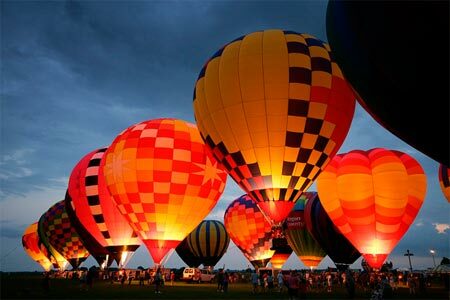 The 2011 Hua Hin Ballooning Festival will be taking place from 12 February to 6 March and you can join in if you wish. Flights will float off just after sunrise each day from the Hua Hin Hills Vineyard for a leisurely one hour flight. Each skippered by a professional Balloon Pilot, you will then fly over beautiful rolling hills countryside, before setting down for a private Champagne Breakfast Tent. The Hua Hin Hills Vineyard is built on a former elephant corral where wild Asian elephants used to be domesticated. Covering some 600 acres with 160 acres of plantation area, its varietals and experimental plots include a range of variety of grapes including Colombard, Chenin Blanc, Muscat, Shiraz. Sangiovese and Tempranillo. The harvest is taken between February and March. At an elevation of 140 to 210 meters above sea level, the weather feels cool and dry. Each flight carries 5 passengers plus a pilot and the experienced crew will be on hand to guide guests through the experience. Prices range from THB12,000 per person for guests of the Rest Detail hotel Hua Hin, or B15,000 for non-guests. will the ballooning festival be held again in 2012? I have tried to check this and the dates I have come up with are 12 February to 06 March 2012. I have not yet been able to confirm this though.